Thank you for the 20,000 hours of service you give to the MCH every year. Here’s just one of our very special volunteers! Two years ago, Stephanie Richard decided to do something more meaningful with her free time. “I only work in a hair salon 3 days a week, so I would spend the rest of my time in shopping malls,” she admits. “I wasn’t being productive and I really wanted to give back to the community.” After a year of volunteering, staff at the MCH found out that she was a hairdresser and suggested she start cutting and styling hair for patients and their families. Stephanie now volunteers every Wednesday afternoon and rotates between the 6, 7, and 9th floor. “This whole experience has been so humbling. At first I expected these parents to be sad and angry at the world, but most of them are optimistic and have a smile on their face,” she says. 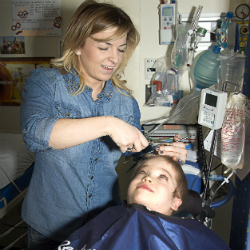 In fact, Stephanie herself was even treated at the MCH as a child while recovering from back surgery.